Wearing a custom henna design is a fabulous way to celebrate yourself no matter the reason! Clients often comment on how relaxing it is to receive henna, to take a break from their busy lives, sit still, breathe, and let someone adorn them. Living Ritual hand mixes each batch of henna paste using the finest natural henna powder available and is certified by the International Certificate for Natural Henna Artists. 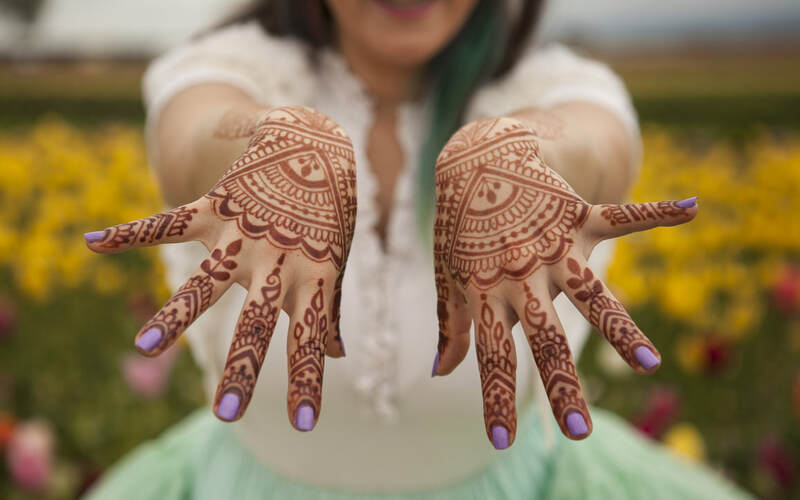 Call 503-833-2900 or click here to schedule your henna appointment or event! Give yourself a celebratory gift through participating in the ancient tradition of henna adornment. We can accommodate one to three people in our peaceful SE Portland studio. Custom designs starting at $30, price depends on the size and intricacy of the design. $80 per hour • Please note: A deposit of $30 must be made by card at time of booking to secure your appointment. This amount is non-refundable if cancellation is in less than 24 hours. The deposit amount applies to the final cost of your design. Henna designs are a unique and memorable party favor for your guests! Living Ritual partners with the Blue Lotus Henna team, bringing skilled henna artists to adorn any number of guests. We are available for weddings, bridal showers, baby showers, birthdays, graduations, Eid, Diwali, Holi, Solstice, Sweet 16, grad night parties, quinceanera, bat and bar mitzvah, prom, corporate events, retirement parties, or any other celebratory event! 5-10 guests • $80 per hour • 10+ guests • $90 per hour • 2 hour minimum. Travel fee may apply. A henna blessing for the mom to be! Receiving a belly henna is a special moment for mom to sit back, relax, and be celebrated. Available as a private appointment or as part of a blessing-way or baby shower. 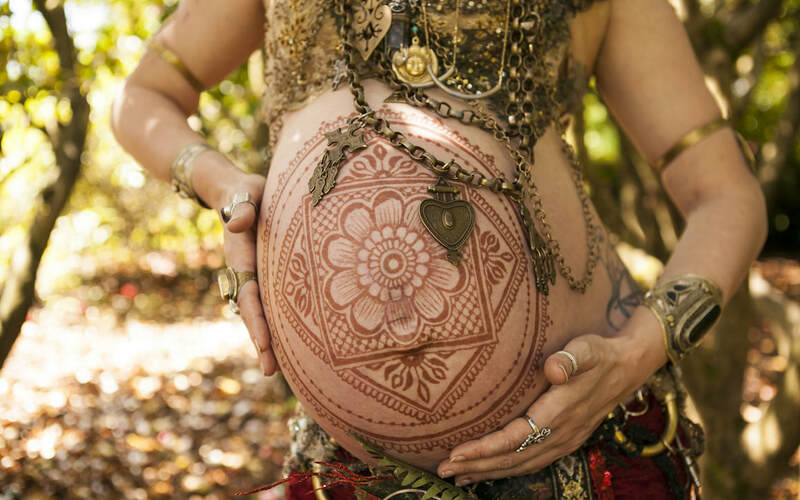 We recommend scheduling your belly henna 2-3 days before maternity photos for optimal stain. 100$ - Appointment is about 2 hours long. *Please visit our "Special Packages" page for a more in depth list of blessing-way options.